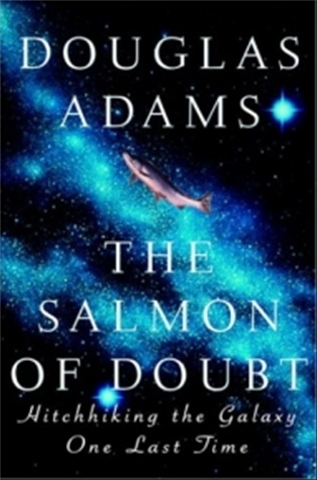 Has anyone else read “The Salmon of Doubt” penned by the late great Douglas Adams? Where does god come from? Douglas basically (to summarize) says that ancient man “The tool maker” made tools to circumnavigate evolution. In other words if he lives in a cold climate he kills animals for their furs. On one hand, the animal has had to adapt over a long period of time to his environment, slowly evolving down the generations to a point where its fur is bushier and can trap more air. The treacherous conclusion becomes that God made the world for my benefit. He goes on to say that the idea of God is so persuasive because of this false perspective. We don’t take into account that we are evolved beings, and that from our direct perspective evolution is very difficult to spot. Douglas goes on to say something very similar about religion. Historically based decisions and reasons permeate religions all through. He give the example of Bali, where they had a religion revolving around rice production, which had a whole set of rules ceremonies and agendas to do with rice planting, phases of the moon etc. Although this religion had what were plainly non-sensical descriptions of Gods, powers and seasons etc it did actually work and the people of Bali grew great rice. This kind of underlying “Folk Psychology”, which exists in all human endeavors such as religion, is in my view the fundamental building blocks of people and societies, and has the most staggering deep-rooted powers and rules that we follow even without noticing. He calls this the “Artificial God”. The idea that there are deep-rooted rules placed in our heads by the auspices of the past generations in the form of religious teachings (and other things) and that as we move forwards into the future our responsibility will be to understand these forces before we destroy them, lest we destroy something that actually has had a practical use in the preservation of our peoples. What say you good people? I personally take the view that our duty to come as people is to sieve out the good stuff from the bad and take it to move beyond the past ideas/ideals. I guess that makes me a kind of futurist, but what the hell. What do you think of the idea of “Folk Psychology” and my personal opinions of its far-reaching powers?